Patients who seek recovery from addiction and eating disorders now have access to new, well-appointed facilities at the UF&Shands Florida Recovery Center, which today opened a scenic campus in southwest Gainesville. Just minutes from the UF College of Medicine and Shands at the University of Florida medical center, the recovery center is home to the largest group of faculty in the U.S. specializing in addiction medicine and addiction psychiatry. The center serves clients from around the country, from all walks of life. “UF&Shands is committed to changing lives by advancing the field of addiction medicine and helping to reduce the devastating effects of substance abuse on individuals, families and communities in Gainesville, throughout Florida and across the country,” said David S. Guzick, M.D., Ph.D., UF senior vice president for health affairs and president of the UF&Shands Health System. Twenty percent of all deaths in the U.S. are linked to addictions and one-third of all hospital inpatient costs — billions of dollars annually ― are addiction-related, according to a recent study at the National Center on Addiction and Substance Abuse at Columbia University. Addiction knows no barriers, said Scott A. Teitelbaum, M.D., medical director of the UF&Shands Florida Recovery Center. Eating disorders are another growing health epidemic within the U.S., especially among the college population. UF eating disorder experts are keenly aware of the strong relationship between eating disorders and addictions, and are on a path to bridge treatment for patients. People with anorexia, bulimia and other eating disorders will eventually have their own intensive treatment program at the new UF&Shands Florida Recovery Center campus. Special programs also will be implemented for groups such as college-age students, women, patients with dual diagnoses, faith-based groups and families. The new campus provides spacious accommodations for recovering individuals enrolled in programs for pain management, eating disorders, co-occurrence of health and addiction problems and drug dependency that results after treatment for other medical conditions. Treatment regimens include complex detoxification and stabilization at Shands Vista psychiatric hospital, comprehensive evaluations, partial hospitalization and intensive outpatient services. The new campus represents an investment of approximately $6 million in land and property, site renovations and new jobs. Newly renovated living suites each accommodate up to three people. Common spaces include a fellowship hall, sports court, reflection pool, outdoor barbecue and laundry room. 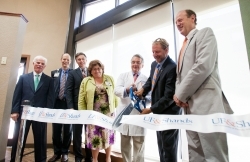 Co-locating accommodations, family and group therapy, 12-step education and outpatient services on the new campus will give patients improved access to UF&Shands addiction psychiatry and medicine specialists. Formerly a Marriott Residence Inn, the new campus has a serene wooded environment that is conducive to intensive, long-term treatment and lifelong recovery. Recovering physicians, nurses, attorneys and other professionals and executives come to UF&Shands from all over the country for addiction treatment through the center’s nationally recognized Impaired Professionals Program. An Intensive Outpatient Program, 12 hours of therapy per week for patients living in recovery, also will take place at the new campus. For more information about the UF&Shands Florida Recovery Center call 352-265-4372 or visit FloridaRecoveryCenter.UFandShands.org.